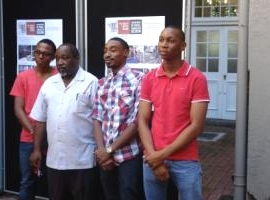 DUT Interior Design students who designed and refurbished public spaces of the University’s City Campus were commended for their beautiful work during a handover ceremony at the City Campus. The event, held on Friday April 26, 2013, at the DUT City Campus was attended by students and lecturers from the Campus’ different departments. The revamp was the brainchild of Arts Design Faculty Executive Dean Dr Kenneth Netshiombo. The My Campus project involved second and third-year students who were tasked with improving the appearance of the staff and student courtyards as well as the canteen area. Addressing the students, Dr Netshiombo said he was delighted with the revamp of Campus. “You have no idea what you have done means. It means a lot to the life of DUT. It (the revamped spaces) now reflects a university. Previously, it looked like a school. It is now beautiful and attractive,” he said. Speaking about the refurbishment, Video Technology Head of Department; Peter Burnett said the students did a good job by giving the Campus’ public spaces a new look. “This is a much improved look of the City Campus which is good for students and lecturers at the Campus,” he said. IMAGE: Dr Kenneth Netshiombo (second from left); Faculty of Arts and Design Executive Dean, is seen with the third-year Interior Design students who led the My Campus project. The students are (from left) Sifiso Shange, Ndabezinhle Ncube and Nkululeko Nzuza.